Nothing says “Welcome!” more warmly than a pretty holiday wreath. Before your guests even get in the door, you’ve already announced that the spirit of celebration is honored at your place. You might think that Christmas and wreaths go together like Santa and reindeer. But actually, the practice of displaying a circle of greens and flowers is much older than the biggest holiday on the Christian calendar. Blame the Persians – or the Romans. Fond of luxury, the Persians came up with floral diadems worn like a crown, which eventually migrated off their heads and into their palace décor. The Romans were probably the first to have a big blow-out celebrating the winter solstice, a multi-day affair of feasting and revels. For Saturnalia, as it was called, they hung wreaths of laurel and flowers at their entries. As with many Christmas customs, the pagan roots of wreath-making are now obscure. The wreath today is a generic symbol of hospitality and good cheer, with variations suitable for any season. As holiday decorations go, wreaths are a perfect example of folk art and even the artistically challenged can shine. It doesn’t take much to look like a designing genius – a glue gun, some florist’s wire and a little imagination should do it. For the freshest look, go natural and celebrate “nature’s own treasure chest,” advises Edle Catharina Norman, author of “Beautiful Winter: Holiday Wreaths, Garlands & Decorations for Your Home and Table” (Sellers Publishing). Her wreaths are artful takes on traditional themes that invite a close inspection of natural colors, textures and forms. Evergreens are traditionally the focus, symbolizing as they do nature’s ever-lasting vitality, even in the heart of winter. You can dress up a Plain Jane balsam wreath just by adding sprigs of blue-tinged spruce, soft pine clusters or feathery juniper branches. And don’t stop there – broadleaf evergreens like holly, ivy and bayberry are elegant and just as long-lasting. Flexible branches, ideally with cones or crusts of lichen, make good wreath bases as well. Natural “ornaments” can be collected in the wild. Norman scouts around in late fall, collecting berries, nuts, seed pods, moss and odd bits of fungi to work into her wreaths. What your backyard may lack, crafts outlets, garden centers and supermarkets carry in abundance. Wreaths needn’t hang out only on your entry door. Laid flat on your table, they make lovely, low centerpieces or buffet decorations. One of Norman’s adaptable ideas: Choose a simple wreath of branches to conceal water-filled tubes and change the flowers as desired. Lots of our holiday preparations are complicated and time-consuming: Making a list and checking it twice; shopping for and wrapping gifts; baking 10 dozen cookies; decorating a ceiling-high tree. Wreaths are small enough to tackle single-handed in an hour or two and simple to decorate and hang. You can’t go wrong – and everyone needs a little of that kind of cheer in their busy holiday. Very berry – Deciduous holly, known as winterberry, drops its foliage in autumn but leaves bright red berries behind. Wired to a metal wreath form, bright berries make a strong, no-fuss statement. Perfectly natural -- Alternating bands of small pine cones and burnished chestnuts create an unusual and effective wreath that can be displayed all winter. Wire or hot glue elements to a straw form. Boughs of holly -- Variegated English holly, trimmed in white, looks crisp combined with juniper and berries. Add a bow and you’re done. Mixed greens – Evergreen textures produce an elegant wreath fit for any door. Fir, juniper and blue spruce combine beautifully on an over-sized door wreath trimmed with laurel springs and berries. Just add ivy – Dress up a wreath with glossy, evergreen ivy for traditional theme with a twist. Understated ribbons and pine cones can add a touch of color. If the door won’t do, hang it from the eaves. Sweet and spicy – Appeal to the senses with ripe pomegranates, fake fruit and bundles of nose-tingling cinnamon sticks. Double your pleasure by using a fragrant balsam wreath as a base. Bright star – Celebrating Hanukkah? 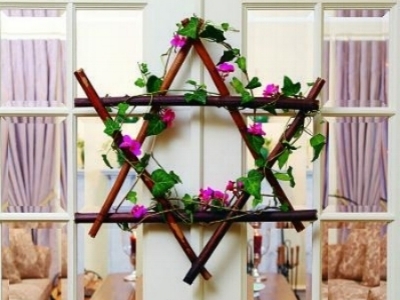 Substitute a fanciful Star of David for the traditional wreath. Create two triangles of stout sticks or bamboo lengths, wire them together and decorate with ivy and seasonal flowers.